If you are planning to retire someday, you have to have a plan. Any such plan will involve saving and building a nest egg over a long period of time to be able to retire with enough wealth off of which you can live comfortably in your Golden Years. The 2015 Retirement Confidence Survey conducted annually by the Employee Benefit Research Institute is a gauge to help determine how comfortable Americans feel about their ability to retire. Its results highlight some interesting facts about how well American workers are preparing for their futures. This year’s survey found that while retirement confidence among American workers surveyed is higher than in years past, 64% of workers say they are behind on planning for retirement, and out of those workers who have no retirement plan, 64% have less than $1,000 saved. Why are these workers not saving for their future? Cost of living and day-to-day expenses head the list of reasons why workers do not save. 50% of workers cited these as factors. However, 69% said that it is possible for them to save $25 per week more than what they are doing currently. 46% said they would give up eating out as a way to boost savings. Soft drinks/snacks from vending machines, movies/streaming services, stops at coffee shops, and buying lottery tickets were other items cited that could be cut to increase saving. However, 24% said they wouldn’t be willing to give up anything to save an extra $25 per week. To put this into perspective, if one were to start with $1,000 at age 30 and save $100 per month for 35 years invested in good mutual funds that earned, on average, 10% per year, the end result would be $385,854.85. If you increase the $100 per month to $500 for the same time period, the compounded savings jumps dramatically to $1,816,863.24. The workers who said they aren’t willing to give up some of the eating out to save $25 more per week might want to rethink that position. 48% of workers said they have not ever tried to calculate how much money they will need to have saved so that they can live comfortably in retirement. Those that have tend to report higher savings goals than workers who have not done the calculation. 29% of workers who have done a calculation, compared with 12% of those who have not, estimate they need to accumulate at least $1 million for retirement. Among the good news from the survey, 67% of workers report that they have saved something towards retirement. Among those with a retirement plan, 35% report having saved $100,000 or more. 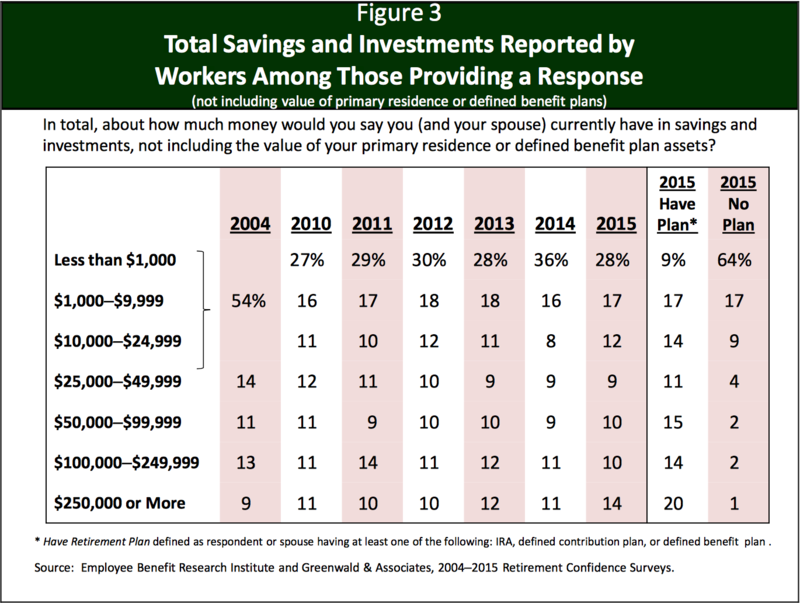 Not surprisingly, workers who report having a retirement plan of some sort had significantly more in savings and investments than workers with no plan. Only 9% of those with a retirement plan had less than $1,000 in savings. 58% of workers said they were either “somewhat confident” or “very confident” about having enough money to live comfortably throughout retirement. 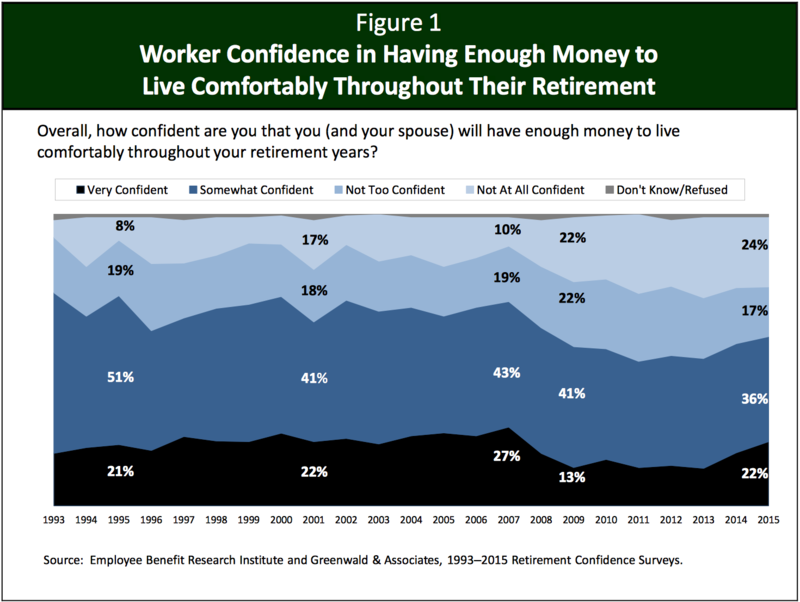 This trend indicates that retirement confidence continues to rebound from the record lows experienced between 2009 and 2013, but this is based on the increasing optimism of those who indicate they and/or their spouse have a retirement plan. The sooner you start saving, the better off you will be when retirement rolls around. Even if you are behind, always remember that it’s never too late to start. Are You Ever 'Too Old' to Invest?